Be the first to share your favorite memory, photo or story of Dorothy. This memorial page is dedicated for family, friends and future generations to celebrate the life of their loved one. 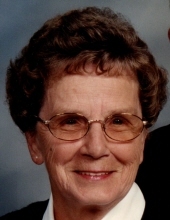 Dorothy Leystra, age 91 of Waupun and formerly of Cambria, died peacefully on Friday morning, Feb. 1, 2019 at Prairie Ridge in Waupun. Funeral services will be held at 11 a.m. on Tuesday February 5, 2019 at the First Reformed Church in Friesland with Rev. Rob Ford officiating. Burial will follow in the Friesland Cemetery. Relatives and friends may call on the family at the church from 9 a.m. until the time of services. Dorothy was born on March 9, 1927 at the family home in Columbia County the daughter of Sam and Hattie (Westra) Katsma. She was united in marriage to Frank Leystra on June 28, 1951 at the First Christian Reformed Church in East Friesland. Dorothy then later joined and was a current member of First Reformed Church of Friesland. Following their marriage, Dorothy farmed alongside her husband and raised a family. In 2002, Frank and Dorothy moved to the Village of Cambria when they built their home. Besides being a devoted member of her church, Dorothy had taught Sunday school and was a member of the Mission Guild. Dorothy will be remembered by her family as a hard working lady that loved teaching her granddaughters crafts and found peace in knitting and embroidery. She had a green thumb, raising beautiful flower gardens and growing African violets. Dorothy will be sadly missed and mourned by her children, Charles D. (Evelyn) Leystra of Randolph, Gary (Barbara) Lestra of Lansing, IL, Tricia (Terry) Sutter of Waukesha; a daughter-in-law, Sandra (Duane) Hill of Onalaska; six grandchildren, Josephine (Rod) Lipka of Sioux Fall, SD, Tara (Dustin) Nelson of Santa Barbara, CA, Diana (Nathan) Leystra Greene of Onalaska, Tiffany (Jon) Vermes of LaCrosse, Dana (Steve) Leystra Smith of Lenox, IL and Gregory Leystra of Lansing, IL. She is further survived by her sisters, Katie, Elsie, Evelyn and Carol; two brothers, Clarence and Dewey; nieces, nephews, many other relatives and friends. Dorothy was preceded in death by her parents, her husband, her son Steven, her step-mother Mary, two brothers, Ted and Gerald and three sisters, Gertie, Jennie and Ann. To send flowers or a remembrance gift to the family of Dorothy Leystra, please visit our Tribute Store. "Email Address" would like to share the life celebration of Dorothy Leystra. Click on the "link" to go to share a favorite memory or leave a condolence message for the family.